It is unfortunate and tragic when drunk drivers do harm to others. It is also reprehensible when drinking establishments serve as enabling agents by contributing to their patron’s intoxication. Many states including Pennsylvania and New Jersey have enacted “dram shop” laws to prevent drinking establishments such as bars, taverns, clubs and restaurants from serving alcohol to visibly intoxicated persons. Liability includes home owners and hosts at private parties who serve minors and guests who are visibly intoxicated. By failing to observe liquor laws, the establishment serving the drivers, can be held responsible for any harm done by their patrons even after they leave the premises. Dram shop laws not only protect those involved in an auto or motor vehicle accident with a drunk driver, but also protect innocent patrons and bystanders who may be injured by bar room disturbances, fights, brawls, shoving matches or thrown objects. Sometimes, the unfortunate outbreaks are caused by or involve drunk minors who were illegally served. In those situations, victims may also sue the establishment that illegally served the drunk individual under the state dram shop laws. Cases involving alcohol liability and the enforcement of dram shop laws are very dependent on the facts and circumstances surrounding the service of the drunk individual. It is important that if a victim chooses to sue an establishment (or home owner) for violation of state dram shop laws, that the victim be able to prove that the drunk individual was illegally served. The victim will need to present evidence that the drunk individual was “visibly intoxicated” when he was served by the establishment (or host). Many times, there may not be witnesses to the level of drunkenness of the drunk individual was served, so the victim will need to rely on circumstantial evidence, as well as the experience and skill of his attorneys to prove that the dram shop laws were violated. Thus, it is important to find attorneys who are experienced and skilled in prosecuting dram shop actions. The attorneys at Meyerson & O’Neill have successfully represented victims of drunk individuals for over twenty-five years, obtaining verdicts and settlements on behalf of their clients injured by those who have been illegally served by taverns, bars, and restaurants. Our firm recently represented a young woman who was involved in an automobile accident with a drunk driver. Our firm favorably resolved this case and the young woman received lifetime financial security as a result of the Dram Shop Action that we brought. 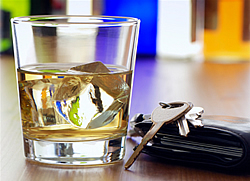 We established that the drunk driver was visibly intoxicated at the time he was served additional drinks at the bar. If you would like us to evaluate your legal problem, please contact us via our form or call 888-773-3515 and ask to speak with one of Meyerson & O’Neill’s experienced dram shop attorneys who can evaluate your case today.